Congrats to Amanda at A Bookshelf Monstrosity,the winner of a $25 Starbucks gift card in my Golden Cup Year End Celebration Giveaway. Amanda is a librarian and provides a wide variety of reviews on her site. I gravitated toward MOTLEY EDUCATION first by the unique title and then by the intriguing and creepy cover design. Sixth grade at Motley Junior High brings more than just the 3 R’s. There’s mystery, ghostly spirits, and a great pairing of two memorable characters, Ebony and Fleishman. The story moves along at a perfect pace. Doses of humor and many plot twists keep the pages turning. The world building in this fantasy is excellent, and you’ll feel like you are right in the middle of the action. There’s series potential as Ebony Charmed still has much to learn as her importance in the grand scheme is very evident. I’m looking forward to the next chapter! FULL PLOT (From LEAP BOOKS) Forget having a lively after school social life, Ebony Charmed is fighting to keep the entire afterlife alive. Fantasy worlds always boggle me with their new words. I was happy to receive a little help before the story began with a welcome Mythical Terms and Creatures section. There’s also more facts in the back along with a quiz to see what role you would play at the school–a Luminary or a Sensory. Norse mythology is a super backdrop to the action. It made me want to learn more about this body of mythology. The creatures are fierce but not too scary. They’re unique and ones you’ll still be happy to keep in the book and not behind one of your doors. The imagination that went into the construction of the plot is superb. You’ll remember Ebony’s tale long after reading. FAVORITE LINES: The remainder of the front door shook, and the eccentric door handle rattled with more noise than Ebony thought possible. One piece of the vase rolled toward the bottom of the staircase. The center of the door bloated like the belly of a plump pig. 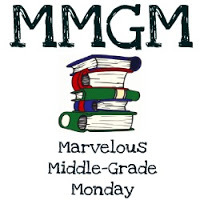 This entry was posted in Reviews and tagged female protagonists, Marvelous Middle Grade Monday, MG book reviews, Middle grade, Motley Education, S.A. Larson. Bookmark the permalink. So excited for Sheri’s book release. She’s worked so hard to get here. And glad you liked this. I love the Norse mythology connection. This book sounds great! I’m trying to read more fantasy books. Thanks for the review! I enjoyed your enthusiasm for a Motley Education and your review. This fantasy world sounds like it has been exceptionally executed. Like the Norse mythology connection with fierce creatures. Congrats to Sheri! I’ve followed her blog for quite a while. Good world building is difficult to pull off (at least for me, which is why I write realistic fiction!) and it sounds from your excellent review as if Sheri’s done a masterful job. Love the line from the school Terms: “Conjuring spells or energy to get rid of a sibling is strictly prohibited.” Fantasy AND humor. Nice. Well, this sounds downright creepy! That should garner a lot of readers in the middle-grade set. Thanks for telling me about this one. I know some people who need to hear about this book. This sounds great. My son would love it for sure. Thanks for telling be about the story. I’m glad you enjoyed the review. I’m sure writing a sequel brings new challenges. Best of luck.